This might be the best idea Pinterest has had in a while. 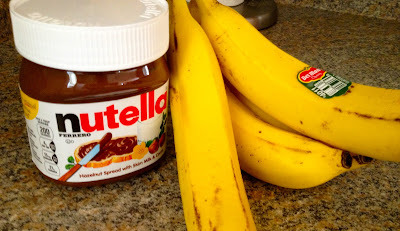 Parker told me he had never tried Nutella before, which should be illegal, so I quickly bought a jar and found this recipe for his introduction to the delicious spread. I gave him a slice of this Nutella Banana Bread for dessert, and he marched right into the kitchen to get another slice. He loved it, and I really did too. It's a weight watchers recipe which can make us all feel kind of good about eating it, but somehow I don't think Jillian Michaels would be praising our will power for eating this. Nonetheless, it's delicious! Try this one! 2. In a medium bowl, cream together butter and sugar. Stir in egg whites. Add banana, vanilla, and applesauce and mix together. Set aside. 3. In a separate medium bowl, stir together flour, baking soda, and salt. 4. Fold dry ingredients into wet ingredients and stir until incorporated. 5. Warm Nutella in the microwave for about 40 seconds or until it is softer and melted. 6. Pour banana bread batter into your greased loaf pan. Slowly spoon Nutella on top of the batter and swirl into the bread using a knife until all the Nutella has been worked in. 7. Bake 40-45 minutes or until cooked through. Let cool and enjoy! You are such a good wife:) you're my cooking/baking inspiration! This looks fabulous! I think I'll try it with this great Trader Joe's chocolate almond spread. Like nutella, but better! Have you ever seen it? but it does look divine like this tho. YES!!!! This sounds so good!!! Ok.. so where shall I send you my address for this? Looks delish! I can't believe it's Weight Watchers! I'm not much of a Nutella gal but Rob loves it--- yummo! Sounds yummy! i'm on the hunt for healthy/low cal recipes, and since it says Weight Watchers, I'm sure it fits what I'm looking for. :-) Gonna pin it! Looks delicious! I am going to have to try it. Pinning it! Well, yum! That looks awesome!! We love nutella! I would like to invite you to SHARE this cool post at my link up party if you haven’t already, hope you stop by every week! I really appreciate your support and encouragement .